Gravitas Communications is a strategic communications firms that operates at the nexus of public relations, Social Media and Search Engine Optimization. Founded in 2005 by Jocelyn Johnson, Gravitas won a Stevie Award for Communications or PR Campaign of the Year in the 2010 Stevie Awards for Women in Business. 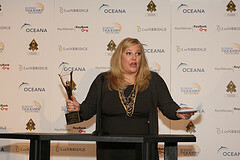 This public relations award was accepted by Jocelyn Johnson at the ceremony in New York on November 12, 2010. See her acceptance speech here. and international media coverage. The Gravitas team architected a comprehensive publicity plan that efficiently reached the broadest audience possible and was inclusive of all major communications channels including: print, television, radio, web, social media and online video. " The next opportunities to win PR awards in Stevie Awards programs? The PR awards categories of The 9th annual American Business Awards, and the PR awards categories of The 8th annual International Business Awards.